Guests can enjoy a complimentary breakfast each morning. Public areas are equipped with complimentary wireless Internet access. This Llubi bed & breakfast also offers tour/ticket assistance, a garden, and a fireplace in the lobby. Casa Mona has designated areas for smoking. Situated in Llubi, this bed & breakfast is within 6 mi (10 km) of Can Gili, Convent dels Mínims, and Church of Sant Domingo. Muro Ethnological Museum and Mallorca Planetarium are also within 9 mi (15 km). Llubi Station is 21 minutes by foot. Tour/ticket assistance, a garden, and a lobby fireplace are available at this bed & breakfast. Free buffet breakfast and free WiFi in public areas are also provided. All 4 rooms offer free WiFi, hair dryers, and showers. 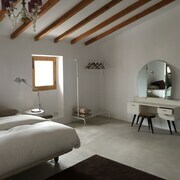 Casa Mona offers 4 accommodations with hair dryers and complimentary toiletries. 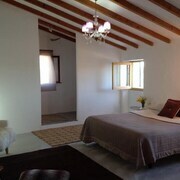 This Llubi bed & breakfast provides complimentary wireless Internet access. Bathrooms include showers. Housekeeping is offered daily and irons/ironing boards can be requested. Cribs/infant beds (surcharge) are also available. A complimentary buffet breakfast is served each morning between 9 AM and 10 AM.